Do you come across a pattern that you need to make right away no matter what else you have on the go or had planned to do? This sweet mini was one of those for me it is a new design by Camille Roskelley and I pulled out some of my treasured Ruby fabric to make it. I am so pleased how it turned out and have worked out where I am going to hang it. Camille also has a bigger version of this but I will wait for the new Bonnie and Camille range called Hello Darling to be released before I make that one. I have plenty to make in the meantime. 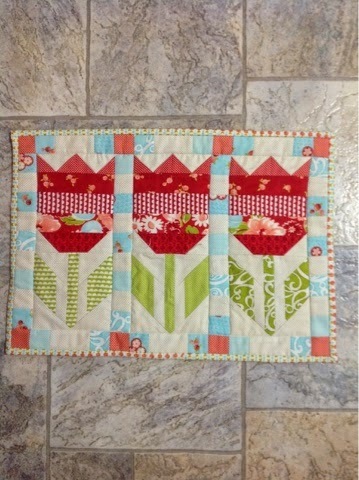 That mini tulip quilt is just darling. I love it. Oh I love your tulip mini. Tulips are one of my favorite flowers. it's so pretty Kim... & yes I know the feeling of wanting to make something straight away...!